There is a lead mine bored into a spur of Ankeny Hill. 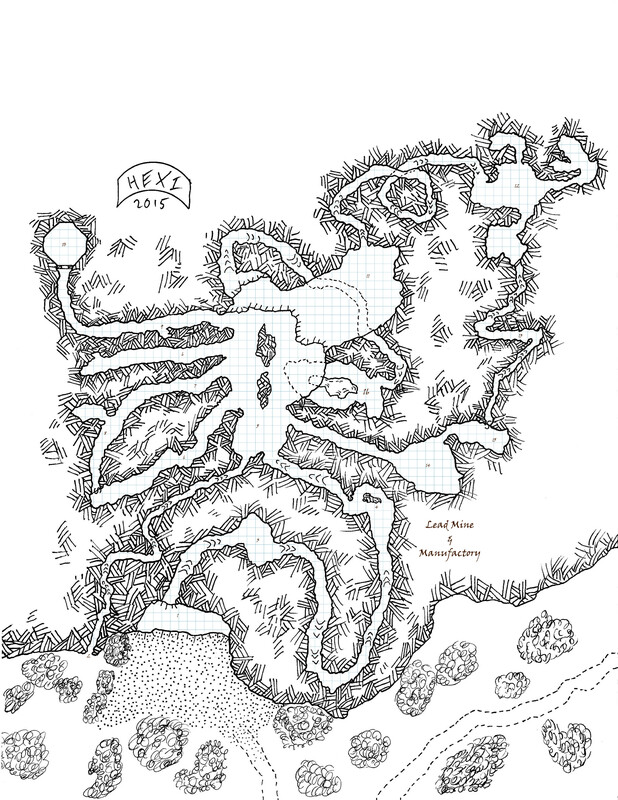 Redsnout Clan kobolds, wise in the ways of the earth, found a seam of galena ore and have been following it deeper into the hill. As the mine expanded, they excavated vertical ventilation shafts and built a smelter to drive the lead out of the galena. Since then, they’ve been digging ore, isolating lead, and using proxies to send ingots and sling bullets to market. Kobold lead mine and manufactory. Player (clean) copy. Click for full size. Sometimes you just want a kobold adventure. Tight quarters, traps, and infinitely infuriating guerrilla tactics. Did I mention traps? Traps kill dungeons. That is, unattended traps kill dungeons. Any GM knows that once the party has run into a trap or two, that party is going to be moving much more slowly through the remaining areas of the dungeon. Absent an outside force hustling the party along, the progress will slow to a crawl. This is unpleasant to game through and an unrealistic use of traps. Fun and unrealistic is fine for gaming; boring but realistic does appeal to a certain subset of gamers; boring and unrealistic has no place in a game. Soldiers since time immemorial have known that unobserved obstacles are useless. Without observation, you have no way of knowing if the enemy is breaching, and if you don’t know the enemy is breaching, you’ve given the enemy all the time they need to reduce that obstacle. Obstacles’ purpose is to impede and canalize someone–to control the space they have access to–so that you can direct force upon them while they’re constrained. To bring it back around, kobolds observe their traps. Either visually, or with a noisemaker, or some other indication that it has been sprung. The traps aren’t really there to kill intruders directly. The traps are there to slow, divide, and distract intruders so that the kobolds can kill them. If an arrow trap pins some wicked little gnome to the wall on the way in, that’s just a bonus. To put it more bluntly, when the party slows down poking and prodding for traps, that’s when the kobolds come around the back to tear them apart. Mine and manufactory gridded and keyed. 5′ squares. Click for full size. It should be remembered that the mine was excavated by kobolds for kobold purposes. Don’t think 10’x10′ finished stone hallways; think meandering pickwork drifts and 4′ ceilings. Don’t think this; think this.